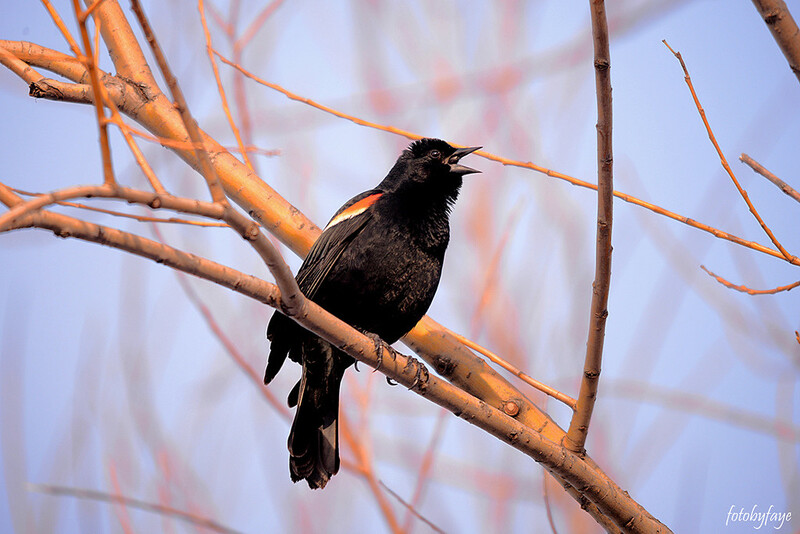 The red-wing blackbird is announcing that it has arrived back after being gone all winter. You are likely to hear this bird before you even see it. It has a very distinct call. Love these birds...........nice sharp shot! Super shot - pity we can't hear her song! Fantastic timing on this shot! Great timing on this shot! Well timed image... love the open mouth. Wonderful capture! I see a lot of them in the country but my telephoto isn's powerful enough. I need to get closer I guess. Nice shot catching the beak open! Their call is the only way I ever notice them - wonderfully focused shot and super timing. What a great capture. I have never seen or heard this bird but our blackbird just started singing now and is a good sign of spring. Fav. Great close-up capture of this beautiful bird. One of my favorite birds. Wonderful sharp shot and great dof.